Bouillabaisse is a French soup. I know, fancy! That is the extent of my knowledge about Bouillabaisse. It is very, very good though. 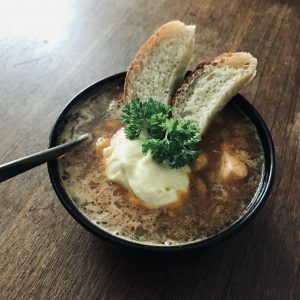 I’m just saying that there might be stuff in the recipe that is deeply disturbing for those of you with a profound historical and cultural connection to Bouillabaisse. If that is the case, I hope you will be able to enjoy it anyway. Hopefully it won’t be like for those dudes who thought that the new(ish) Ghostbusters movie ruined their childhood because it cast women. But maybe it will? Maybe someone’s childhood will be ruined because I am suggesting you to put some crushed tomatoes in a Bouillabaisse? Food and words are powerful things. 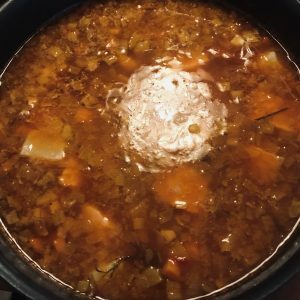 A little bit about the actual recipe. Three things are vitally important. 1) Do your own broth. 2) Don’t overcook the fish. I will get to how how to avoid overcooking in the instructions. And 3) … ok, two things are vitally important. 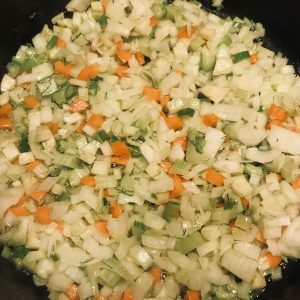 The base of the soup is as it is with most soups; a great broth. I really like shellfish broth, so I often use one made from shrimp shells, but any seafood-based broth is good. Besides the broth, what gives the soup its character is the mix of fennel, orange, saffron and white wine. I also think tomato goes really well with all this which is why I put some crushed tomatoes and tomato puré in mine. It is really quite spectacular. I don’t mean my version but just… in general. Bouillabaisse is quite spectacular. To the instructions! So. Lot’s of ingredients but I promise: not complicated at all. Brine the fish. This is very optional but I really think brining is great for fish. What’s brining? Well it’s simply putting something in salty water. This gives more juice to the fish (or meat) and a nice natural saltiness. Dissolve 50-60 g of salt in 1000g (1L) of water and let it cool down (use 1/3 or something of the water to dissolve the salt by heating it on the stove, then mix that with cold water). Cut the fish into pieces (approximately 3 x 3 cm) and put it into the brine. Put it in the fridge. Put the oven on 250 C and peel the shrimp (save the peeled shrimp for later). Spread the shells across an oven plate and put it into the oven for about 10 minutes. The shells should become white, not burnt. Bring two (2) liters of water to a boil. Cut the veggies into pieces and put them in. Add the grilled shrimp shells. Put the bay leaves in with som pepper and let the broth simmer for at least an hour, more if you have the time. It should reduce to half the initial volume. Salt to taste at the end (if the broth is nice and salty in the beginning it will be horribly over-salty when reduced). Pour the broth through a sift to remove the veggies, pepper corns (if you’re using that) and bay leaves. 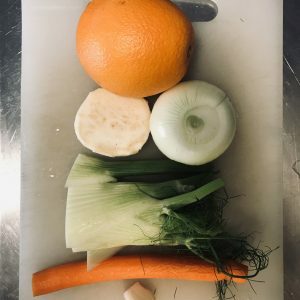 When the broth is finished, chop the celeriac, carrot and fennel into small cubes and finely chop the onion (note: not the cooked vegetables from the broth). Put the butter and some oil in a big pot on medium/ high heat. Fry the chopped up vegetables for 10 minutes. After 5 minutes, put in half of the saffron, all of the tomato puré (10 g/ a spoon full), the peel from half an orange and stir. Pour in the broth, the wine, the juice from the orange, the crushed tomatoes (200 g) and bring to a simmer. Put in the other half of the saffron and add salt and pepper to taste. This is the finished product so taste and adjust a lot of times. Use salt/ sugar/ vinegar to get the balance exactly as you want it. Now turn the stove off, put a lid on the soup and let it rest on the (now off) stove plate. Make the Aioli. Aioli is mayonnaise with some garlic so it’s real easy (here’s our recipe for plain ol’ mayo including video). Mix the egg yolks with the mustard, some vinegar, salt, pepper and one finely chopped (or pressed) clove of garlic. Whisk intensely (or use an electric mixer, immersion blender or other appropriate machine) while carefully (ok, not that carefully) pouring the oil into the mix. As always, balance with salt/ pepper/ vinegar or lemon, at the end. If you’re only whisking by hand, the Aioli will be a bit “fluffier”or less dense, than if you do it with a kitchen mixer or immersion blender. I like the consistency you get with an immersion blender. Now take the fish (in brine) out of the fridge and sift away the brine. Put the fish and peeled shrimp into the soup and let that rest for about 5 minutes. The after heat from the soup will cook the fish perfectly. Just to be completely clear: you DO NOT need to cook the fish in boiling/ simmering soup, the after heat is enough. The soup is still 80-90 C and fish like cod and salmon is best when around 50 C in the center of the pieces. Serve with a generous dollop of the Aioli, some bread and a bit of fresh herbs. I really love this dish. And it’s really nice if you’re hosting a dinner party. If you prepare the broth, the fish (by putting it in brine, which you can do the night before if you want) and Aioli beforehand, you can really do this from start to finish in less than 30 minutes.